Deleting your Facebook account requires some preparation and a fairly well-hidden link. - Ask Leo! Deleting your Facebook account requires some preparation and a fairly well-hidden link. How Do I Delete My Facebook Account? 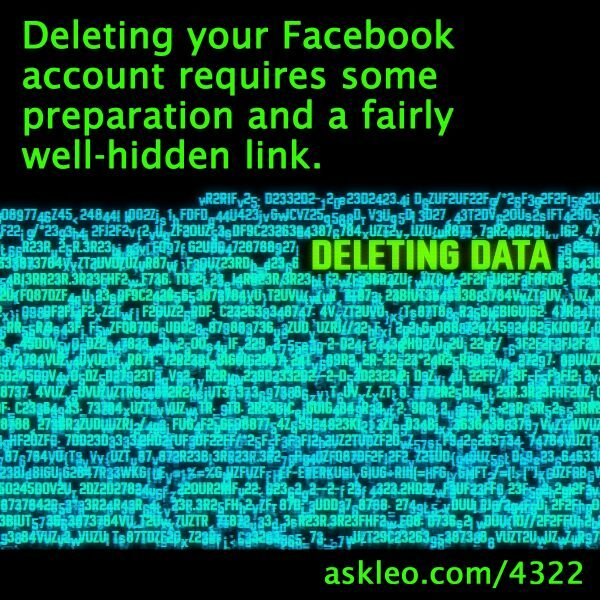 - Deleting your Facebook account requires some preparation and a fairly well-hidden link. I'll outline the preparation and point you to the link. « Previous post: Every so often, the Windows Print Queue gets stuck. Let’s clear that up.